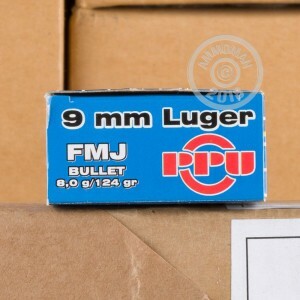 This 1,000 round case of 9mm Luger ammo from Prvi Partizan is just what you need to get some real trigger time with your weapon of choice. These cartridges fire a 124 grain full metal jacket bullet that has similar ballistic properties to many popular carry loads. Like other Prvi Partizan ammo, these rounds use non-corrosive Boxer primers and brass cases and are manufactured in one of three facilities in Uzice, Serbia. 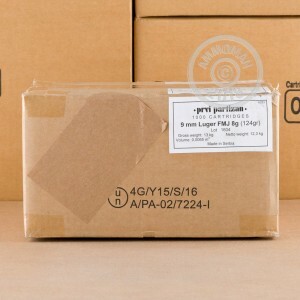 Place your order today to qualify for free shipping from AmmoMan.com! My product arrive quicker than expected and couldn't be happier to hit the range. So far, I've put a few hundreds rounds through my G17 and G43 without an issue. Great stuff! 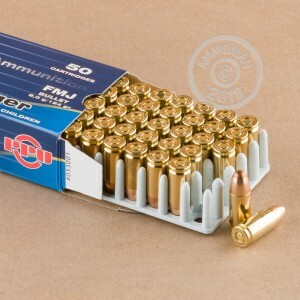 Ammoman great fast fast shipping.Will buy from again 9mm ammo worked with no problem over 500 rounds.